Coconut flour crepes are easy low carb desserts crepes perfect to satisfy your sweet tooth with no guilt. They are delicious stuffed with yogurt, fruits or nut butter. It is a 100% Dairy free, paleo and gluten free crepe recipe that all the family loves. There is no secret about this : I am addicted to crepes and you know it ! Well, I am French and eating crepes every week is part of my culture. I love having crepes or dessert , to fix my sweet tooth without blowing my carbs level. Usually, I go for my low carb almond flour crepes but today I want something different. I am a coconut flour lover so I give a try to coconut flour crepes. I saw many good recipes online to inspire from but I choose to develop my own adding few tweaks and make those more close to the Authentic French Crepes recipes I had as a kid. So if you are on a low carb diet right now and craving a delicious guilt-free sweet dessert my sugar free coconut flour crepes are the one you need! 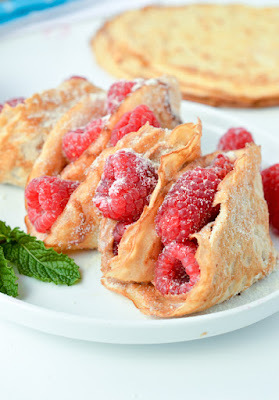 I stuffed my crepes with almond butter, a bit of sugar free crystal sweetener – erythritol works for me and fresh raspberries. It was very tasty, the texture of the coconut crepes is light, fluffy and similar to the french crepes I used to eat before. Enjoy the treat and see you soon on the blog! Using a whisk or electric mixer, beat until a smooth batter form with no lumps. Set aside for 10 minutes to allow the coconut flour to soak the liquid and thicken the batter slightly. Heat a lightly oil mini egg pan over medium/high heat. I used coconut oil that I rub on the pan with a piece of absorbent paper. My pan is a mini non stick egg pan size 4.7 inches (12 cm). I recommend a small saucepan of this size to make perfect crepes that won't break. Pour 1/4 cup of the crepe batter onto the pan, then tip and rotate the pan gently to spread batter as thinly as possible. Brown on one side first, cook 2-3 minutes until the sides are crispy and un stick easily from the pan. The center should be set and dry before you flip over to avoid the crepe to break. Brown on other sides about 1-2 minutes and serve hot with your favorite fillings - see recipe note for inspiration. Crepes size: I made 6 mini crepes of 12 cm (4.7 inches) with this recipe. I used a non stick mini frying pan. Storage: you can store your crepes on a plate, covered with plastic wrap, in the fridge up to 2 days. Rewarm in the pan few minutes, add filling and enjoy. Low carb filling ideas: nut butter (almond butter, peanut butter, coconut butter), yogurt, cream cheese, raspberries, monk fruit sugar or erythritol, sugar free chocolate chips, sliced almond, seeds or crushed peanuts etc. In the picture I used almond butter, erythritol and fresh raspberries. 0 Response to "coconut flour crepes – low carb + gluten free"